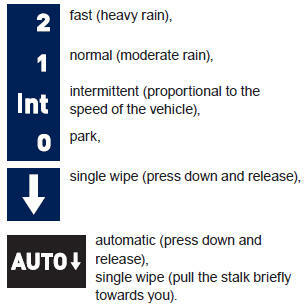 The wipers are controlled directly by the driver. If a significant accumulation of snow or ice is present, or when using a bicycle carrier on the boot, deactivate the automatic rear wiper via the vehicle configuration menu. 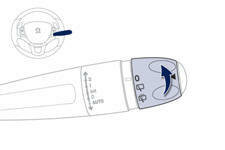 The function is activated or deactivated via the vehicle configuration menu. This function is activated by default. Pull the wiper stalk towards you. The windscreen wash, then the windscreen wipers, operate for a pre-determined time.